The email editor in Blanchard Exchange provides various formatting options for your emails such as adding style to text, inserting links, and even inserting images. Use this page as a guide for formatting options, rather than step-by-step instructions. TIP: Using the screenshot below, hold your mouse over the icons in the screenshot below to see the name of each icon/formatting option. Clicking on an icon in the screenshot will take you directly to that icon's description (along with any applicable options). Set your font to bold. You can either highlight the font you'd like to style and then select the Bold option, or you can insert you cursor, select Bold, and then begin typing. Set your font to italics. You can either highlight the font you'd like to style and then select the Italics option, or you can insert you cursor, select Italics, and then begin typing. Set your font to underline. You can either highlight the font you'd like to style and then select the Underline option, or you can insert you cursor, select Underline, and then begin typing. Set your font to superscript. You can either highlight the font you'd like to style and then select the Superscript option, or you can insert you cursor, select Superscript, and then begin typing. Use the cut function to copy and remove text from your email that you wish you paste elsewhere. Using your mouse, click and drag over the text you want to cut. You can then select this option to remove it. Use the cut function to copy text in your email that you wish you paste elsewhere. Using your mouse, click and drag over the text you want to copy. You can then select this option to copy it. After using the Cut or Copy functions, use this to paste your text into your email. 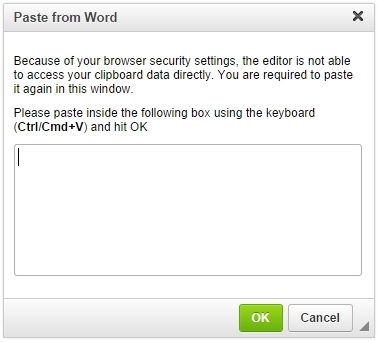 Using your mouse, click in the the email where you wish to paste in your copied text. Once the blinking cursor is in the spot you wish to add your text, select this function to paste. Similar to the paste function above, this will paste in your text while also removing any added formatting such as bold, links, etc... Using your mouse, click in the the email where you wish to paste in your copied text. Once the blinking cursor is in the spot you wish to add your text, select this function to paste your text without any formatting. A new window will open that will ask you to paste in your copied text (Figure 1). Follow the directions on this new window to paste in your text. If you are copying text from a Word document, this function will allow you to paste in your text with formatting (such as bold, links, etc...) while removing extra code that may be copied over from Word that could modify your existing formatting. Using your mouse, click in the the email where you wish to paste in your copied text. Once the blinking cursor is in the spot you wish to add your text, select this function to paste your text without any formatting. A new window will open that will ask you to paste in your copied text (Figure 2). Follow the directions on this new window to paste in your text. Select this option to undo your last edit. If you used the Undo option above, this will redo the previous edit you undid. Insert a numbered list into your email. To add an additional number line to your list, hit Enter/Return on your keyboard. To end the list, hit Enter/Return on your keyboard twice. Insert a bulleted list into your email. To add an additional bulletedline to your list, hit Enter/Return on your keyboard. To end the list, hit Enter/Return on your keyboard twice. Decrease the indentation of your paragraph. Increase the indentation of your paragraph. Align your text to the center. Align your text to the right. Justify your text alignment so that the first and last words of each line are aligned with the left and right margins. You can choose to insert a link directly (i.e. if your link is "www.example.com" the link will show exactly as "www.example.com" to individuals receiving the email). To insert a link directly, click where you want the link inserted and then click on the Insert Link icon. You can use text to act as a link (i.e. if your link is "www.example.com", your link text could appear as "Click Here" to email recipients which would take them to www.example.com" when they click on "Click Here"). To set text as a link, hold down your mouse click and highlight the text you wish to use as a link. Once the text is highlighted, click on the Insert Link icon. Protocol: Includes "http://", "https://", "ftp://", "news://", and "<other>". (The average web address will use either "http://" or "https://"). If you are unsure of what protocol to use, reach out to your Blanchard Exchange Support Contact for assistance. 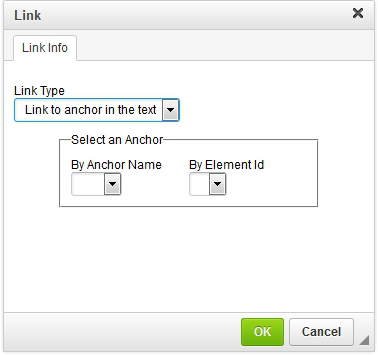 Link Type (Link to anchor in the text) - If you are using anchor tags and wish to insert links to go to different sections of the email, this option will include methods for selecting the anchors either by the tag name or the Element ID (Figure 4). Note that you must use the Source editor to insert anchors. 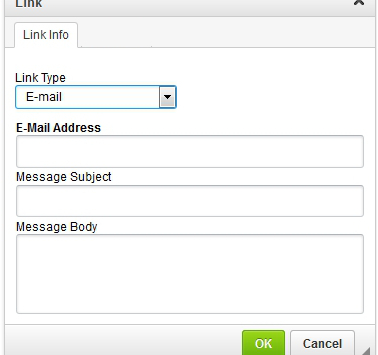 Message Subject: This is the default text that will be inserted into the subject line of the email when an individual clicks on the email address you've inserted. Message Body: This is the default text that will be inserted into the body of the email when an individual clicks on the email address you've inserted. Remove a link from your email. 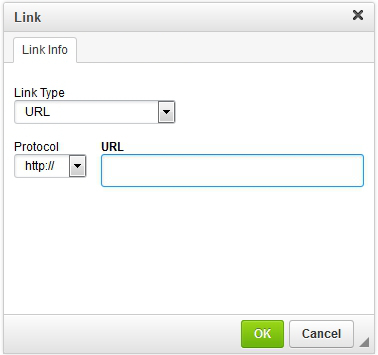 To remove, click on the text that is a link in your email, and then select the "Remove Link" icon to convert the link to regular text. Rows: The number of rows. Width: The width of the table. Adding "%" to this box will set the width to a percentage instead of pixels. Height: The height of the table. Adding "%" to this box will set the height to a percentage instead of pixels. Headers: Specify whether the first column, the first row, or both should act as headers. Border size: Specify whether to add a visible border to the table along with the border size. Size is set by the number of pixels. Alignment: Specify whether the table should be aligned to the left, center, or right within the email. 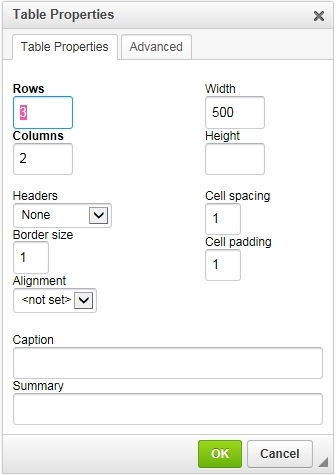 Cell spacing: Specify the spacing between table cells in terms of pixels. Cell padding: Specify the padding in table cells (the space between content and border of the cell) in terms of pixels. Caption: A text label that shows just above the top of the table. Summary: Provide a summary of the table contents (used for assistive technologies such as screen readers). Id: Set an ID on the table (useful for stylesheet rules). Style: Enter custom CSS rules. Language Direction: Set the direction of the text in the table from either "Left to Right (LTR)" or "Right to Left (RTL)". Stylesheet Classes: If you are using an external stylesheet within your template, you may apply existing classes using this text box. Your image must be uploaded to a public website/URL in order to use this feature. If the image is loaded in your Blanchard Exchange library, it will not display in the email. Alternative Text: Provide a short description of the of the image (used for assistive technologies such as screen readers). Width: Set the specific width of the image. Adding "%" to this box will set the width to a percentage instead of pixels. Height: Set the specific height of the image. Adding "%" to this box will set the height to a percentage instead of pixels. Border: Specify whether to add a visible border to the image along with the border size. Size is set by the number of pixels. 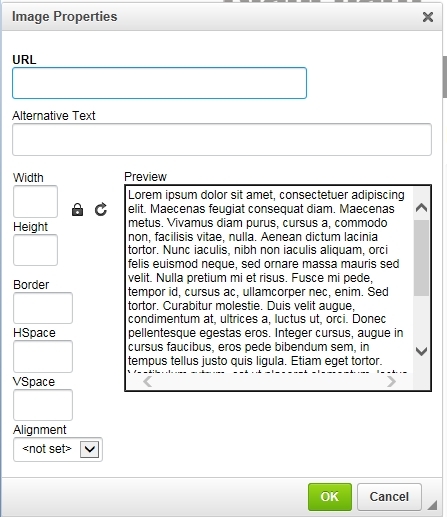 HSpace: Set the horizontal spacing/margin between the image and content around the image. Spacing is set by the number of pixels. VSpace: Set the vertical spacing/margin between the image and content around the image. Spacing is set by the number of pixels. Alignment: Set the alignment of the image to either "Left" or "Right". This also enables content to wrap around the image. View/edit the HTML source code of the email. Remove any existing formatting from your content (bolded text, alternative font styles, etc...). Use your mouse to highlight the text that should have it's formatting removed and then select this icon. Set the initial font style (Arial, Tahoma, Verdana, etc...) starting from the point where your cursor is inserted in the email. To change the font style of existing text, use your mouse to highlight the text that should have it's font style changed and then select a font style from this menu. Set the initial font size starting from the point where your cursor is inserted in the email. To change the font size of existing text, use your mouse to highlight the text that should have it's font size changed and then select a font size from this menu. Set the initial text color starting from the point where your cursor is inserted in the email. After selecting this option, you will be presented with a color palette with basic color choices. Selecting "More colors" will bring up additional choices and will even allow you to enter specific HEX color codes. To change the text color of existing text, use your mouse to highlight the text that should have it's color changed and then select this option. Set the initial background color (similar to highlighting) starting from the point where your cursor is inserted in the email. After selecting this option, you will be presented with a color palette with basic color choices. Selecting "More colors" will bring up additional choices and will even allow you to enter specific HEX color codes. To change the background color of existing text, use your mouse to highlight the text that should have it's background color changed and then select this option.